Whoever said, 'You can take a boy out of the country, but you can't take the country out of the boy,' must have been thinking of Rick Book who was born June 29, 1949, in Loreburn, Saskatchewan and raised on the family wheat farm. Rick's first book for YA's, Necking With Louise, contains seven linked short stories about a 16-year old adolescent, Eric, who was growing up on the Prairies in the mid-Sixties. "I still recall the thrill at first seeing William Kurelek's painting, 'How Often At Night,' at the Mendel Art Gallery in Saskatoon in 1972. It's a painting of a farmer with his horse-drawn stoneboat out in a snow-covered field at night. He's just finished cleaning the barn and has spread the manure around his field. And now he's leaning on his fork and gazing in awe at the stars. It was the first time I'd seen something in my life as the subject of art. I felt powerfully the artist's respect and reverence for that small, quiet, humble moment. It was about us! That's why I thrill when I read our stories and see our art. I'm no intellectual, but it reminds me of who I am, gives me a strong sense of place, and a reason to celebrate." 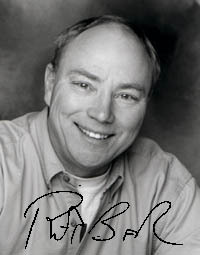 Rick attended the University of Saskatchewan in Saskatoon, where, in 1970, he completed a three year BA, with a major in English and history. "When I was at university in second year, I'd gotten involved in student radio, then called CJUS-FM, and I just threw myself into it. I became very interested in the media and became a producer of a local folk program and recorded local artists. In my third year in Saskatoon and based on my CJUS experience, I got a job as a part-time disk jockey at CKOM. I quickly tired of the 'time and temperature' and all that and went into the news department. I took a fourth year at the University of Regina in history, worked again in student radio, and, when I finished my year, I went back to Saskatoon because CKOM had called me up and offered me a job. I worked there briefly. The CBC was opening a new news bureau in Saskatoon, and they called, offering me a job." "I was with CBC for 10 years in Saskatoon and for almost another two in Edmonton. I took a year off for traveling in Mexico and sailing in the Bahamas and Virgin Islands, and then I went to Winnipeg where I spent a summer. That was followed by three years in Ottawa. My work was all TV with some radio because you did both when you were in the 'regions.' I got married and moved to Toronto where I spent three years with CBC before I decided to leave and become a freelancer. I guess I was too much of an entrepreneur"
"When I was with CBC, I'd done daily news, covered the provincial legislatures, city hall and all of that stuff, but when I was in Ottawa I had the best job I've ever had. Being young and foolish at the time, I didn't know it though. I was like the 'Son of Charles Kuralt' of the Seaway and Ottawa Valleys. I had the best cameraman, and I just found interesting people doing interesting things and went out and interviewed them. By today's standards, I had the luxury in a small newsroom to shoot for a day or two and spend three days editing and putting together feature stories. They could be about some old guy who caught frogs in a marsh for a lab, a scissors factory in Perth, a goldsmith up in the valley near Pembroke, or hippies living in a mill making masks. It was just anything that struck my fancy. That was the storytelling that I grew up with and didn't appreciate. However, I was torn because I thought, 'Well, these "soft" people stories won't advance my career at the CBC. I need to do so-called "hard" news,' and so we moved to Toronto. My wife wanted to take computer programming, and, at that time, Toronto's Humber College was the place for such studies. So, 20 years ago, we moved here, and I worked for CBC, covering Queen's Park." As a freelancer, Rick was initially involved in a variety of tasks. "I did three things. For three years, I was one of two senior speech writers for the Minister of Energy. I wrote magazine articles on a variety of things, and I also wrote films, including part of a series on renewable energy for TV-Ontario that sold around the world. I had a ball doing that. During this time, we were renovating our house and putting in an addition, plus, this being Toronto, paying down the mortgage as fast as we could. We had two babies, and I was working just crazy hours as a freelancer. I'd come home, have dinner with my kids, put them to bed, and then go back to my office until two in the morning." "One night, I was sitting there exhausted, and Jane, my wife, and I were talking. I said, 'You know. I want to do something that's more fun.' Jane's brother-in-law was in advertising, and she suggested, 'Why not that?' I put together a portfolio and was hired by McCann Erickson actually. I've worked in advertising ever since, first in agencies and then freelancing for 10 years. I've loved the freelancing because I have my total freedom and work out of my home. I used to write a lot of radio commercials and still do. One of my producers kept saying, 'You have an interesting voice. You should do a demo tape.' I'd just laugh, but, at one point, I'd had it with agencies and went sailing in the Virgin Islands for a week. When I came back, I said, 'OK, let's do that demo tape.' Because I'd been a writer and knew how to do that sort of thing and he was a producer, I came up with a really good sounding demo tape and got work right away. So, for 10 years, I've been making my living as a voice actor. Now, I'm doing a lot of documentary work because it has a lot more meaning than just commercials. The voice business isn't a "job." It's all freelance, and I have an agent. You go to auditions, and you "win" the job. There's no "guarantee" on anything that I do, but I've learned to live this way, and I love it. I wouldn't have it any other way." "A couple of years ago, I was hired by an agency to write an ad campaign for the Stratford Festival, and it was successful. But I wouldn't want to return to the world of ad agencies because the agency experience is just an awful experience. Here we get to the nub of everything, to my writing Necking With Louise and in being in Peter Carver's workshop: there's respect for the craft of writing. There's reverence for words and ideas and the toil and the pain that it takes to string them together to tell a story. In advertising? Boom! It's gone. Obviously there's respect at some level, but only if it's sold. It was the opposite of how I really felt, and I realized a huge conflict in my life." "Consequently, what I decided to do last fall was not to do any more copywriting for advertisers. I'm just doing my other work. I don't know anyone in advertising who's really happy because everyone up the line, within the agency and out, can say "No," and there's one person that can say "Yes." So, no one has any power or control, and it's not exactly "soul" work. I came to recognize that it's really against my values. I'm not saying it's wrong. It's made me a very good living, and it's provided for my family, but it's just not right for me any more. I still have to do voice work. This process of writing Necking showed me how important that kind of respect and the integrity of the work are to me, and I thought, 'So this is what I'm going to do.' In a way, after the CBC, I reinvented myself career-wise, and now I'm trying to do that again as a writer." Necking was not Rick's first book. 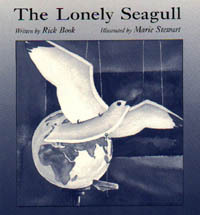 "In 1993, I had a children's picture book, The Lonely Seagull, published by John Flood at Penumbra Press. It was a story I'd made up and told my kids at bedtime. Every now and again, we used to put the books away, and I'd say, 'Ok, let's make up a story tonight. My son, Christopher, is 19, and my daughter, Alison, is 16, but, in those days, I'd tell them the bedtime story, and then we'd take turns making up stories. The Lonely Seagull was one they liked that stuck. A few years later, I wrote it out and met someone who said, 'I've got a brother in publishing.' It got published, but it really didn't sell very well. I didn't know how to support it, and no one told me what to do. But on the strength of that book, I thought, 'I'll try this as a nice hobby,' and so I took a class from Barbara Greenwood at Ryerson. She has a really good class, and I wrote a juvenile novel, an environmental novel, and a couple of other stories, one about my grandfather's barn." "I'd found a place called Boardwalk Books whose publisher was Peter Carver. I thought, 'I live in the Beaches, and there's a boardwalk. There's got to be synchronicity here.' I sent Peter what I'd written, and we met. Peter said, 'Your novel is deeply flawed (as Barbara Greenwood had told me as well). However, I love this other story about your grandfather's barn. You should come to my writing group.' And that's how I ended up in Peter's writing group. It's actually a class, and you register through George Brown. It's a workshop, and the environment's just amazing. It's the best thing I've ever done. I'm in my fifth year now. Every story in Necking got workshopped in that class, and it took two years to do it." "When I came into Peter's class, I was trying to write more picture books. Barbara Greenwood had told me that my voice was a young adult voice. I guess I didn't feel I was good enough to write for an older age group at that point, and, being really 'dumb' at the time, I thought. 'Picture books are easier.' I kept trying picture books, but then one day in the class someone, who's now a really good friend of mine, read this incredible story. Hearing it just opened up for me permission to write a story that I'd actually thought about writing and then decided, 'No, I don't want to write about that. It's not a very "nice" story.' However, when I heard her story, I went home and just blazed it out in three days. That story was the cork in the bottle, and, in the end, you throw away the cork and you drink the wine. So I threw that story out because it just wouldn't have been appropriate, but writing it was cathartic I guess." "I didn't know when I started that there was going to be a collection of short stories. I just started writing stories, and, after I read that first one, I went home and made a list of eight stories, and those were the stories I wrote. I said, 'I can write them,' and they changed because I didn't have them thought out or anything. I never saw them as being part of a whole, and, if I'd thought the word 'novel,' it would have scared me and I'd have probably stopped even more than I did stop. I didn't really go to the classes with the intention of making it a career. I thought that this was just something nice that I'd do on the side." "'Necking with Louise' was one of the first stories I wrote along with the hockey story, 'The Game,' and the 'Clod Hoppers Halloween Ball.' When I started writing 'The Game,' I created two documents. One was all the 'old' stuff, and one was about the game, and I thought, 'I don't want to throw this other stuff out, but I don't know what to do with it. I'll just merge them.' I had a real problem writing 'The Summer I Read Gone With The Wind.' I was getting 'lazy' at that point. It was one of the last ones, and I thought, 'I'll try something different and write it as a series of letters back and forth between the two characters,' but it just didn't live. It was flat, and yet I really liked the story and didn't want to kiss it off. However, I got through the 'laziness' and actually the story's one of my favorites because I did work on a construction camp. What I really like about it is that it pays tribute to a lot of the people, the kind of people you meet when you're out working on those things. You're the coddled kid who's being raised by this community, the village, and suddenly you go out of that and see the real world and what it's like for people. That Eric, the central character, is 16 is significant because that was the year I got my driver's license. There really was a '58 Ford. Getting your driver's license is really important, especially on the Prairies where you can't hop on a subway." Through the character of Gus the mechanic, 'The Summer I Read Gone With the Wind' also acknowledges another aspect of Rick's growing up. "Gus went into town and went to the library, and that was very important to me, the notion that it's all there, and all you have to do is go find it. Libraries are there, and where they are is wisdom. Saskatchewan people are great library users. We were nine miles out from Loreburn, a very small town of perhaps 500 people at that time. I guess my mom registered us with the Saskatchewan Public Library System, and they sent out a questionnaire about our 'likes.' My two younger sisters and I'd fill out this card, and in it would go. In time, Dad would come home with a brown parcel, and it was our books. We'd run like crazy and grab those books, and I'd have one read that day. That's what you did out there. You devoured those books, and, as soon as you finished, off they'd go back, and somebody who had our 'likes' and what we'd read on a card somewhere, not on a computer, would pick some more and out they'd come." Death makes its way into the latter part of Necking, and Rick remarks that "someone in a review noted that the book contained three near death experiences. First of all, 'Saying Goodbye to the Tall Man' was just a wonderful way to pay tribute to my grandfather, and so that's a natural death to be in there. The other death, the river story, that death happened, but it happened at the foot of my street in the Beach. A guy drowned himself, and I was coming along with my dog when some little young girl came running to me and said,'He's trying to kill himself.' I ended up jumping in and fishing him out and doing CPR, but he didn't recover. So that happened as I was writing this, but I can't tell you why I stuck it in there. In the Sundog story, Eric's sitting there fearfully in the blizzard thinking about all the apocryphal stories he grew up with about the drunk hunters freezing on a barb wire fence. Those were very scary stories to grow up with, but they taught you to respect the weather and that's part of the growing up out there on the Prairies. It's not too forgiving. You can't just call CAA." When it came time to edit Necking at the publishing stage, there wasn't much to do. "My children were the first readers, and they've always read everything I've written first. They'd tell me if this sounded right or if it didn't, and they would make no bones about telling their dad about what's wrong and what's right. Most of the rest of the editing work took place in the workshop, and that was the beauty of Peter's class. There are so many good writers in that group. When I went into that class, I didn't know how to listen to other people. And I never knew how to be constructive, and that's what you learn there. It teaches you how to listen and how to look for the 'gold.' The workshopping was the major part of the editing process so that when it came time for Peter to edit, he said,'You know. My job is virtually done,' and the actual editing was very minor. Every Thursday night is class, and there are three terms, fall, winter and spring, in the year. You're expected to read twice each term, and I can't imagine spending an Thursday night any other way. It's the highlight of my week." Necking With Louise was the book's title "from day one," says Rick. "That's my commercial background. I thought that would be a good title, and I tried it out for two years on people. They laughed every time I said it, and so I knew that it would work. A year later people would ask, 'So, how's Necking With Louise going?' Because they would remember it, I thought it was a good title. And I love the cover. It was far more than I expected. Most book stores are putting it face out which, to me, is a good sign that they like the cover too. The book's been picked up by Harper Collins in the US, and Germany has also shown interest in the book." A promotional CD contains "The Game" and the title story. Rick acknowledges that the idea was his, and, because he's a professional voice actor, he's the CD's narrator. "It just seemed to be a natural, and I was very pleased that Red Deer agreed to do it. I've suggested that we do the entire book as a CD." There was a huge amount of discussion in class about whether or not Necking was a YA novel. I thought I was writing a young adult book, but all these adults in the class kept saying, 'Oh, no. This is an adult book.' Peter was getting this message loudly and clearly, and he passed it on to Dennis Johnson, the publisher at Red Deer. I guess they positioned it as a 'crossover' book to their sales force because Chapters and Indigo both have it in Young Adult and General Fiction, and, in every bookstore I go to, I check to see where it is, and it's often in both sections so I'm just delighted." Critical recognition has come in the form of Necking's being selected as the Alberta Children's Book of the Year while 'Sun Dogs" received the Vicky Metcalf Short Story Award. When asked about the autobiographical nature of the contents of Necking, Rick coyly references Katharine Patterson who, when asked if something was true, answered, "Oh, I hope so." Rick adds that a very good friend in Saskatoon, who, when he heard Rick claim that Necking's contents 'were all fiction,' laughed and said, "Yeh, and I was there for a lot of it." Rick acknowledges that "there is a 'Louise,' and her name really is Louise. The story is fictionalized, but we did date briefly." Rick says that he's been in touch with Louise and that "she loves the book. She laughed a lot, which is good, and she's not suing me." In describing his writing habits, Rick says, "I know I'm fairly self-deprecating, but I've really been a very undisciplined writer. I now regard this as my paying work, and the 'other' is my supplemental income. Because I'm a farmer's son, I can get up really early, and I'm a morning person. I would set goals for myself, like having a certain story done by 'this' date, and I would get up at 4:30 in the morning to do it. I'll write until it doesn't feel good to write any more. I don't have a set time or even a set number of pages. I might write until noon but hardly ever past two unless I'm really cooking." As seems to be his way, Rick finds himself immersed in several things at once, including his 'literary' output. "Ive got a couple of projects I'm really excited about. One is a YA project about robots. I've been wanting to do this thing about robots, and I'm really not into technology. I'm very lo-tech and finally broke down and got a cell phone just so that, when I'm stuck in Toronto traffic, I can call my kids to say I'll be late. But the robot story, which is tentatively called 'Robot Toast,' is very funny, quirky and off-the-wall. Someone in my class described it as 'post-modern deconstructionist.' I thought, 'That sounds good.' I'm having a ball writing it, and then we'll see if anyone wants to publish it. 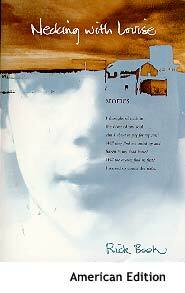 I'm working on an adult novel that's a fictionalized version of a true story that took place in Saskatchewan while my parents were young. I'm daunted about writing a novel because these stories were satisfying small pieces, and I don't yet know about how to write a novel." Amazingly, Rick's stated career aspiration as a high school student was to be an advertising copy writer. "That's what I put in my grade 12 yearbook. Where that came from I have no idea. I wasn't that serious, and it didn't 'empower' me. What happened is that when I got to university, I went over to CKOM and asked them about that line of work, and they said, 'We just have some young girls writing local announcer copy here, but, if you really want work in advertising, you'll have to go to Toronto. 'Toronto! That's so far away.' So I just enrolled in university. But before I left CKOM that day, the lady said, 'Why don't you do an audition to be an announcer.' It was amazing, but this is Saskatoon in the late Sixties, and that's the way things happened. So I went in, and the local pop DJ got some copy and I read it and walked out. I thought that was it, but, three years later, I was back there as a disk jockey. I guess I planted a seed somewhere, and I ended up being a voice actor and a copy writer. At university, I had no idea what I was going to do. I still didn't after four years really, but then phone rang. I've been very lucky all my life because the phone has always rung. My 'career' has not been motivated or propelled by me. I've actually had problems with that in that I haven't been single-minded. Things came along, and so I've done them. I've worked with some great people who really taught me well and I learned on the job." "I wasn't raised to be a farm boy. I recall seeing my parents at three o'clock in the morning, standing looking out the window and watching the clouds go by to see if that cloud was going to come by and bring rain, and I thought, 'I don't want to live like that.' There just didn't seem to be any control in your hands at all, and the price of wheat depended on things like whether the Soviets or the Argentinians had a good or bad harvest. I just wasn't that much of a gambler. I feel really lucky that I did leave, and I've been away for a long time, but I'm glad that Necking shows how much I love where I come from. I'm the guy who went to Toronto, and everyone has the image that I 'live' the razzle-dazzle life as someone who was a reporter and who was in advertising and all that slick stuff. But I'm a simple farm boy, and this book's my way of showing what a rich life I have. My kids and I always look up when we go outside to see what the sky's up to, where the moon is and what stars are out. That comes with growing up on the prairies and being in touch with land and sky." The Lonely Seagull. Illustrated by Marie Stewart. Penumbra Press, 1992. Preschool-grade 3. Necking With Louise. Red Deer Press, 1999. Grades 7 and up. *This article is based on an interview held in Toronto, January 30, 2000.